With a Bachelor in Civil Construction, as well as two collegiate degrees in Architecture and Real Estate, Mr. Lamothe has been providing clients with his expertise since 1981. As CEO of companies specializing in real estate development as well as commercial, industrial and residential construction, he has been responsible for the design, financial structuring, marketing and execution of real estate projects since 1984. 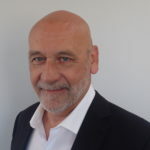 Moreover, he has been active as a commercial real estate broker since 1987, founded the real estate agency Trans-Inter and was co-owner of the real estate agency Consuldev until the Fall of 2010. He was head of the commercial division of the Binswanger Myre Pageau real estate agency until August of 2014. He is now President and Senior Real Estate Broker for the agency he founded with his partner Danielle Riendeau.